Love the Pink Man! Do you thiink he's made out of rose quartz? I would love to stroll thru your beautiful home someday...you have so many interesting pieces.. I love the blend of east and west at Linderhof - it's delightful, restful and always interesting. DB -- I'm not sure -- but we do love him! I, too, was thinking rose quartz or a pink marble- just lovely! Wow...thats beautiful. We have a friend who is a professional iceskater and traveled all over the world touring. He has several pieces like this and they are made of jade. Most of his are green but he has a few this color as well. His wife doesn't like them and has them put up on a shelf in the kitchen corner..such a shame because they are so pretty! I'm happy to see your sitting out in the open! Yours is just beautiful as well!! Thanks for sharing! His name in Chinese is 寿星 - shou xing. 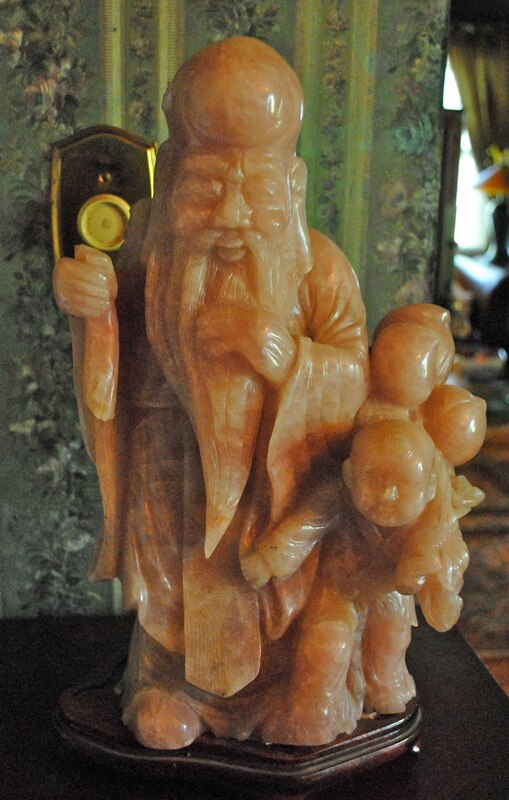 He is the god of longevity in Chinese myth. Mostly made of jade or something else I don't know how to translate in English. He sure looks like he is made of Jade to me. Although most people think of Jade as being green, it comes in many color and a common type of Jade is the tan color. He seems to have all the characteristics of Jade. G'day Martha ~ I love your statue ... I love Oriental art of any sort.